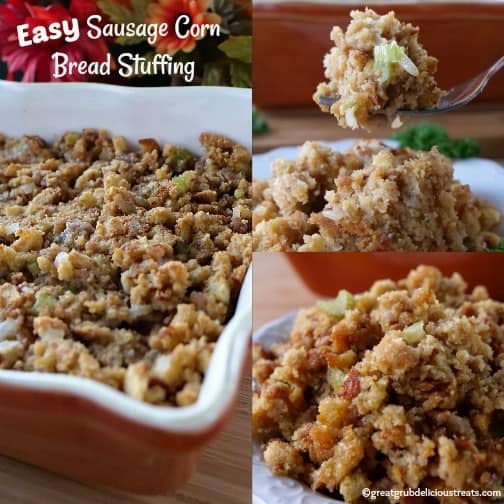 There are so many different ways to make stuffing for the big Thanksgiving feast and here’s another way with this easy sausage corn bread stuffing. With each bite, you get that wonderful sausage flavor along with the savory corn bread stuffing. 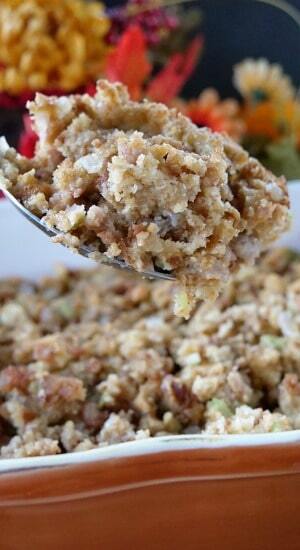 Stuffing is so good and as a kid, I disliked stuffing. Well, I said I didn’t like it, but in fact, I had never tasted it. WHAT WAS I MISSING throughout my childhood? 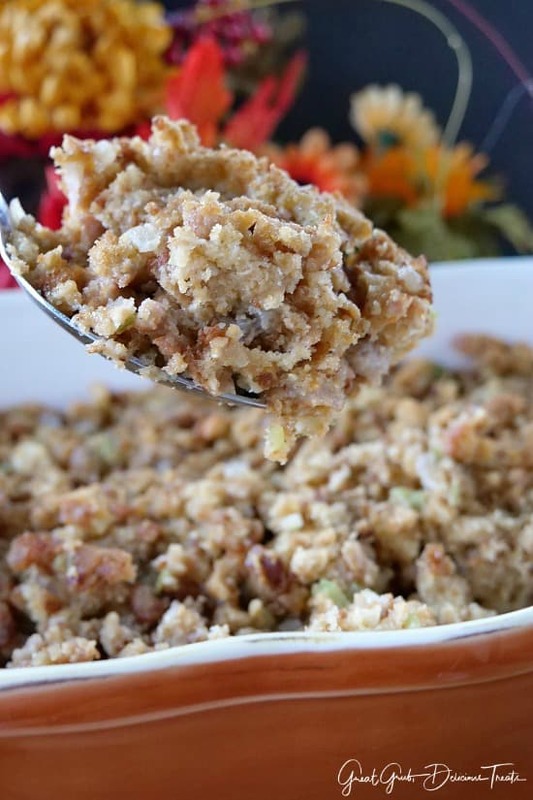 Geez, was I in for an awakening when I actually tasted stuffing for the first time. I absolutely LOVED it! And, it’s one of my favorite things to eat on Thanksgiving! 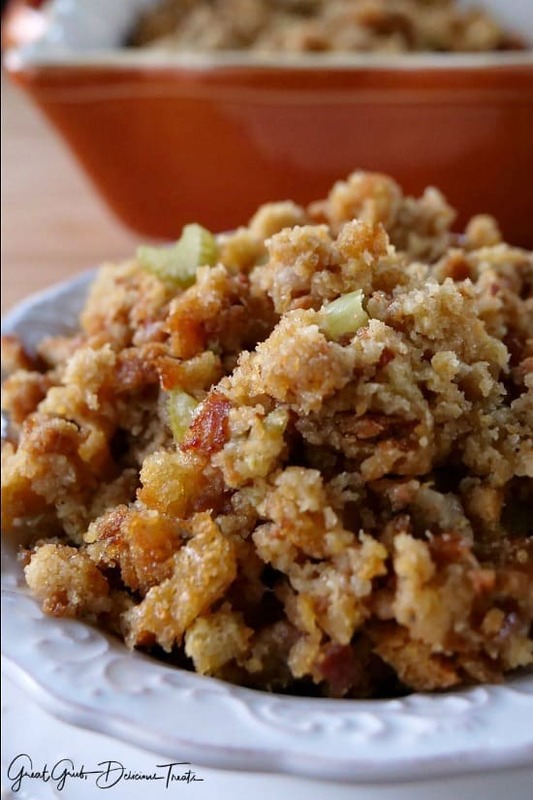 This stuffing is easy to make and can be made in a casserole dish like this or on the stove, in a crock pot/slow cooker and of course, stuffed inside the bird. 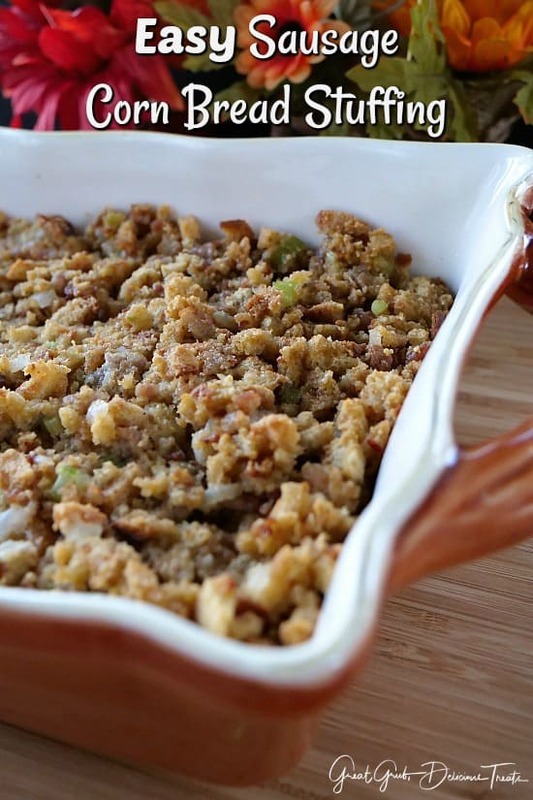 So many different ways to make delicious stuffing. This is just one of the ways I make stuffing. 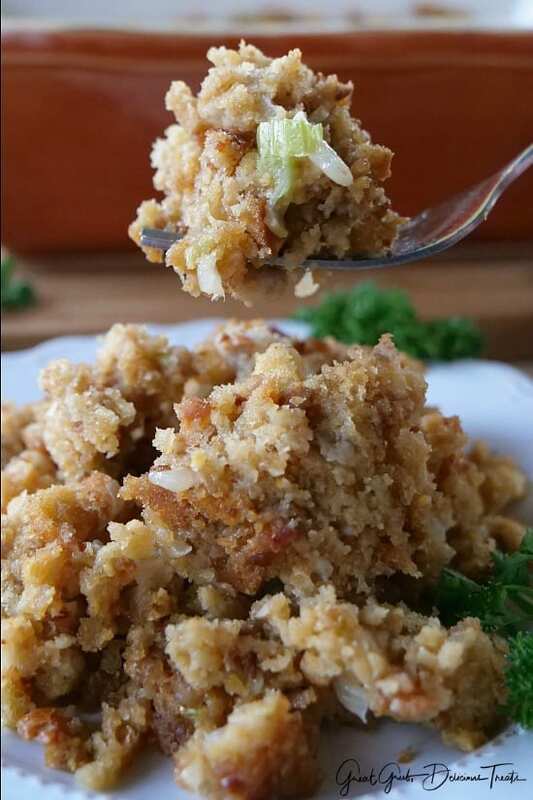 Time was an issue to get this on the blog since I was sick for almost 2 weeks prior and just started feeling betting a few days ago, so this easy sausage corn bread stuffing is super easy to make and not much work preparing it. 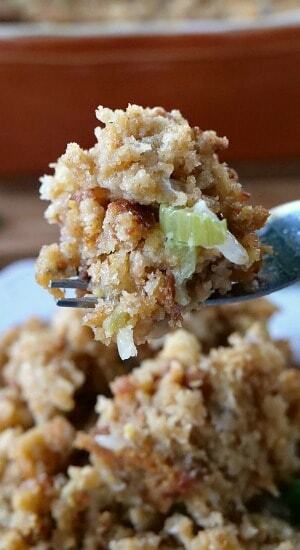 A pretty simple recipe using a box stuffing mix. What is your favorite thing to eat on Thanksgiving? Is it the stuffing, the turkey, the mashed potatoes or (like a few people I know) the desserts and rolls? We here are Great Grub, Delicious Treats hope you have the most wonderful Thanksgiving ever! So many things to be thankful for and I am very thankful for all of my readers who support my blog and enjoy my recipes. Thank you to each and every one of you! 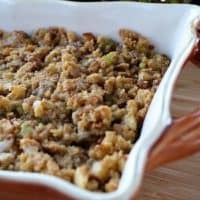 In addition to this easy sausage corn bread stuffing recipe, here are a few more delicious side dishes that are perfect for Thanksgiving dinner: Cheesy Garlic Scalloped Potatoes, The Best Mashed Potatoes, Hot Corn Salad, and lastly, how about my latest dessert recipe, a delicious Cranberry Orange Pecan Crisp for dessert. Preheat over to 350° and spray a 9 x 13 casserole dish with a non stick spray. Set aside. In a large frying pan, crumble sausage with a spoon and cook over medium flame until browned. Drain grease, set aside. In a large sauce pan over low/medium flame, melt butter and then add chopped vegetables. Cook until translucent. While vegetables are cooking, add chicken broth and then add the egg to a 2 cup measuring cup. Whisk until well incorporated and then whisk again right before adding broth into the corn bread mixture. Once the veggies are translucent, add the stuffing mix and sausage to the sauce pan, stir, then pour the chicken broth and egg mixture into the stuffing mixture Stir until well combined. Spoon stuffing mixture into the casserole dish and cover with foil. Bake for approximately 40 minutes, removing the foil the last 10-15 minutes for a crispy top. Top with gravy and enjoy!